Available for all aircraft. Yes, all aircraft! And in just a matter of seconds and without doing any math you can maximize your load without violating your center of gravity or weight limitations. American Aeronautics has produced weight and balance plotters for all aircraft since 1981. 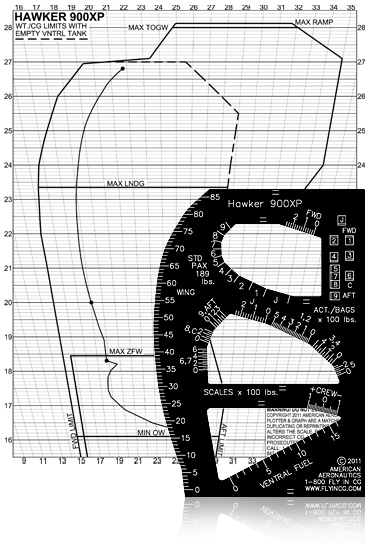 A complete weight and balance kit includes a plotter (template) and graph. The plotters are manufactured on site from black anodized aircraft grade aluminum and all the information on them is computer engraved. The graph paper can come in several formats including plain, carbonless duplicate, triplicate, quadruplicate or even plastic laminated for reuse. The plotters and graphs can even be customized to meet your needs. SPEED – With little practice, a weight and balance calculation can be done in about 10 to 20 seconds. OBSERVABILITY – You get a picture of what is happening to your center of gravity and weight as you add payload. If the cg goes out of limits, there is no math to do. It’s easy to just visually determine what needs to be changed to get back into the approved limitations. All weight and cg limits are shown on the graph to insure compliance with those limits. You can see your cg travel from takeoff to landing. ACCURACY – There are no addition, division, or table reading errors. A line is simply drawn to the appropriate weight. Graphs are a full 8.5 x 11 inches (custom sizes are available on request). Error is less than 1⁄4 of one percent. In manual calculations, passenger and baggage weight estimates normally have an error of ten percent or more. REPEATABILITY – The vectors can be added in any order. The answer will be the same. Student pilots can get a feel for weight and balance rather than trying to understand an abstract mathematical concept. SIMPLICITY – No math required. If you can draw a line, you can compute even the most complex calculation. APPROVED! – The vector method has been used and approved by FAR 91, 135, 121, 125 and 141 operators. In addition, it is used and approved by international air carriers from all around the world.